I memorized Neal Asher’s name as an author to watch after reading Strood (In Years Best SF 10). The story was so weird; I felt it actually captured the feeling of “alien”. I read a lot of science fiction but rarely do I feel challenged that what I’m reading, what’s supposed to be “alien”, is any great leap away from familiar and human. Seems to be the quick and easy way to create an alien civilization is to exaggerate one small cultural practice and make it uniform for an entire race. Deciding to start at the beginning of Asher’s Runcible (Or Polity I’ve seen it called) Universe, I read Gridlinked… Just a whole mess of clichés and “junk”: Ideas and characters that can seem intriguing or, I will say it, cool, at a glance but are ultimately broken in many ways (shallow, childish, stupid). I’ve made peace with the fact that Neal Asher is not my personal salvation and now enjoy his stories as just pure fun. 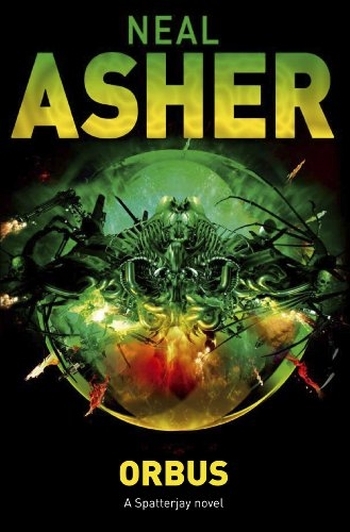 But such was the strength of Strood that I still look into new Asher novels hoping for a return to that alien feeling. His short stories are consistently good, fun, and entertaining, so my faith gets incremental reassurance. I write all that so that it’ll make sense when I write “I was surprised by Orbus”. Asher actually changed the fundamentals of his universe. And, perhaps it was a realigning of my expectations but, the junk ideas were more fun this time and not as exasperating. There were moments of “alien” feelings. But more important than expanding the range of imagination is feeling that characters are actually doing / changing. Else what is the purpose of the story? I WILL NOW SPOIL VARIOUS STORY ELEMENTS. The spatterjay virus worked on a number of levels to really make this story. First, I will admit, it makes people really cool. I love that Asher can fit this ancient sea captain into his science fiction universe and have him not be ridiculous. Beautiful thing that traveling a little this way and you can get a heavy cybernetics / A.I. emphasis, and cross a line over here to get brutal monsters, and in-between are all manner of cowboy types and monolithic superbeings. 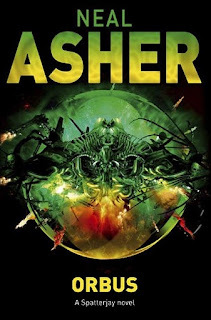 Orbus (the old captain) underscores the raw cruelty of Asher’s universe by being powerful only by virtue of the virus, which at first is just another natural part of the universe. As if the universe is saying “here is a match to your best creations”. Later, once it’s revealed that the virus was engineered by a mysterious / ancient / long gone/ incredibly powerful race (but they’re bugs! Which are typically the fodder of alien races), the virus still functions as a warning that everywhere has something that wants to kill; not even a world completely lacking in technology is safe. Characters that are driven to acquire new (armor, ship, money, armies, powers) imbue the story with life. I care much more about someone, real or fictional, actively pursuing a goal in their life. Characters just out to solve THE problem are boring. I want to see all the sides of that character, what they would do if they had X power. And the best thing about the spatterjay virus was that, so long as the character kept living, they got more abilities. More possibilities to do. It feels like the universe is actually going somewhere. Characters only goal isn’t to reestablish the status-quo set at the beginning of the story. Topple a king, invent immortality, even discovering a better career are much better uses of their time and mine. The virus also added this mean undercurrent in that anyone infected with the virus, but that couldn’t eat non- infected food to recover, would lose their mind to the virus. Now every battle has a cost to be paid at the end. A new something that must be acquired. Little events, like eating or equipping new armament, make the character more than a plot device. It also means I get immersed in the fiction, which is exactly what I want. Orbus was full of that. I got so excited when Vrell captured the dreadnaught class Prador ship. And justifiably so. He created an army, got in a position for revenge, got a base with all sorts of utility. Best of all, as far as progression of story in concerned, the virus changes this animalistic, feudal, shortsighted race, into something that will at least have a long term goal. They may stop eating their own young, which is both a metaphor and not. I was so happy the character of the Prador gets altered, not because they weren’t any good before, but because they’ll become more powerful (and thus interesting) by the results of contact with the spatterjay virus. So enjoyable to see Asher shuffle around his universe. And at a fundamental level! This universe’s identity was Polity vs. Prador. And now the Prador are different. I don’t even know what the details of this shift are; just the fact of evolution gives me a good feeling in the reading. Also, on the naming conventions Asher uses. Many of them I hate. Sniper, Dragon, Prador. I associate such names with a level of creative prowess that would be insulting to Mr. Asher (because he is not at that level). Prador is obvious a few letters chopped and switched from Predator, which is an accurate adjective for them but also plain and ugly. Even just use a better adjective to cut up. Vicious. Viious / Vious / Vous. I’ve got a thing for names and this continues to bother me a great deal.